Discussion in 'Science' started by longknife, Mar 11, 2014. From http://blogs.discovermagazine.com/imageo/#.Ux8ibt6wVig comes a report that the situation in the western Pacific may be leading to the resurrection of the phenomenon that causes major climate changes throughout North America. If the Pacific Ocean does give birth to El Niño later this year, the beleaguered residents of Canada and the Upper Midwest of the United States might be spared a repeat next year of this winters brutal polar conditions. Thats because El Niño typically brings warmer than average temperatures to these areas. And, if I'm not wrong, it might ease the drought in some regions of the USA. Just need to wait and see. Ma Nature does her own thing and there isn't much Man can do to stop or change her. Sunday 19th March, 2017: A sudden and abnormal warming of Pacific waters off Peru has unleashed the deadliest downpours in decades, with landslides and raging rivers sweeping away people, clogging highways and destroying crops in a potential sign of a global El Nino pattern this year. At least 62 people have died and more than 70,000 have become homeless as Peru's rainy season has delivered 10 times as much rainfall than usual, authorities said Friday. About half of Peru has been declared in emergency to expedite resources to the hardest hit areas, mostly in the north where rainfall has broken records in several districts, said Prime Minister Fernando Zavala. Peru is bracing itself for another month of flooding. A local El Nino phenomenon, the warming of surface sea temperatures in the Pacific, will likely continue along Peru's northern coast at least through April, said Dimitri Gutierrez, a scientist with Peru's El Nino committee. Local El Ninos in Peru tend to be followed by the global El Nino phenomenon, which can trigger flooding and droughts in different countries, said Gutierrez. The U.S. weather agency has put the chances of an El Nino developing in the second half of 2017 at 50-55 percent. While precipitation in Peru has not exceeded the powerful El Nino of 1998, more rain is falling in shorter periods of time - rapidly filling streets and rivers, said Jorge Chavez, a general tasked with coordinating the government's response. "We've never seen anything like this before," said Chavez. "From one moment to the next, sea temperatures rose and winds that keep precipitation from reaching land subsided." 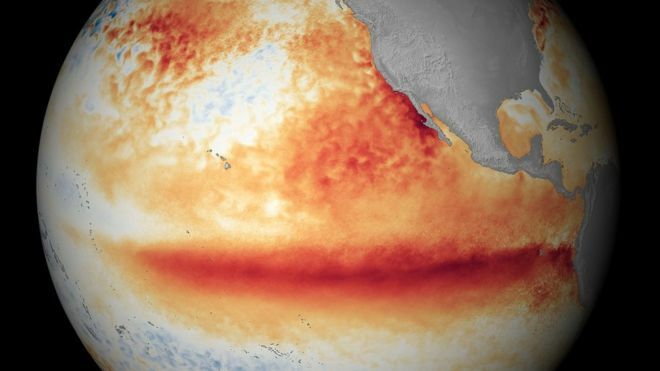 Some scientists have said climate change will make El Ninos more frequent and intense. In Peru, apocalyptic scenes recorded on cellphones and shared on social media have broadened the sense of chaos. A woman caked in mud pulled herself from under a debris-filled river earlier this week after a mudslide rushed through a valley where she was tending to crops. Bridges have collapsed as rivers have breached their banks, and cows and pigs have turned up on beaches after being carried away by rivers. "There's no need to panic, the government knows what it's doing," President Pedro Pablo Kuczynski said in a televised event, urging people to stay clear of rivers. In Lima, the capital, classes have been suspended and running water has been restricted after treatment systems were clogged - prompting a rush on bottled water that produced shortages at some supermarkets. The vast majority of people affected by the extreme weather are poor, including many who built makeshift homes on floodplains that had been dry for 20 years, said Chavez. "There's no electricity, no drinking water...no transit because streets are flooded," said Valentin Fernandez, mayor of the town Nuevo Chimbote. Chavez said Peru must rethink its infrastructure to prepare for the potential "tropicalization" of the northern desert coast, which some climate models have forecast as temperatures rise. "We need more and better bridges, we need highways and cities with drainage systems," said Chavez. "We can't count on nature being predictable." The "Nino / Nina" theory is so much manure. Obviously there are other factors at work. Another being Weaponizing Weather experimentation. Weather happens, get over it. 10 September 2018 - There's a 70% chance of a recurrence of the El Niño weather event before the end of this year, according to the World Meteorological Organisation. The last El Niño occurred in 2015-16 and impacted weather patterns around the world. Researchers say they are not expecting this new one to be as intense as 2015-16. According to the WMO, climate change is influencing the traditional dynamics of these weather events. The El Niño/Southern Oscillation, to give its proper title, is a natural event that involves fluctuating ocean surface temperatures in the Pacific, which influence the weather all over the world. The 2015-16 El Niño was one of the strongest ever recorded, and had an impact on global temperatures, which saw 2016 enter the record books as the warmest year. As well as heat, the event also led to drought in Africa that saw food production plummet in many countries across the continent. South America saw floods across Brazil, Argentina, Paraguay and Uruguay. This year started with the opposite to El Niño, the so-called La Niña phase. This saw cooler than average sea-surface temperatures in the Pacific. That has now faded and, according to the WMO models, there's a 70% chance of another El Niño developing by the end of this year. However, it is expected to have less impact than in 2015-16. 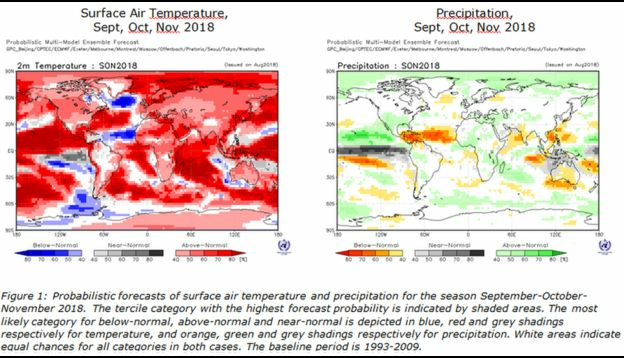 "WMO does not expect the anticipated El Niño to be as powerful as the 2015-2016 event, but it will still have considerable impacts," said WMO Secretary-General Petteri Taalas. "The advance prediction of this event will help save many lives and considerable economic losses," he added. For the first time, the WMO has coupled the El Niño update with a global seasonal climate outlook for the September-November period. The forecast says that above normal surface temperatures are forecast in ][/center] nearly all of the Asia-Pacific region, Europe, North America, Africa and much of coastal South America. While El Niño events normally occur every five to seven years, the recurrence of the event so close to the previous one, suggests that climate change may be having an impact. "Climate change is influencing the traditional dynamics of El Niño and La Niña events as well as their impacts," said Petteri Taalas. "2018 started out with a weak La Niña event but its cooling effect was not enough to reduce the overall warming trend which means that this year is on track to be one of the warmest on record." Separately, Japan's weather bureau said there is a 60% chance the El Niño weather pattern emerging during the northern hemisphere autumn from September to November. than are dreamt of in your philosophy.”. 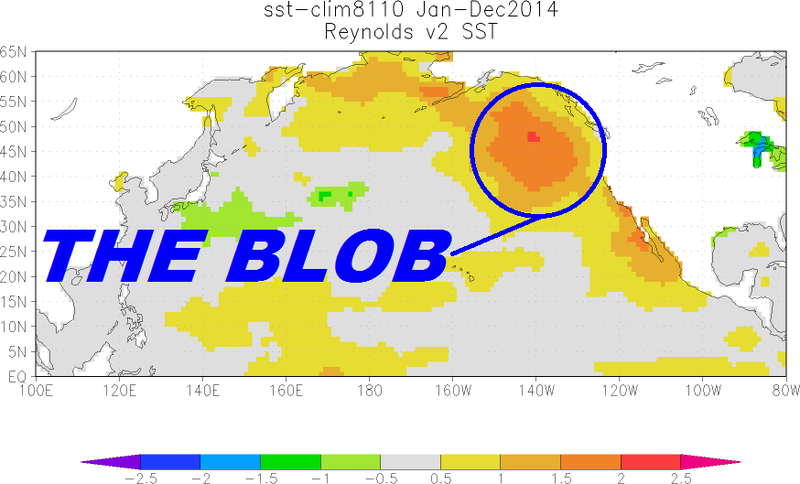 The Pacific Coast has been experiencing what are termed, "blobs". Warm Water not associated with the dogma. A year or two ago it hung off the Southern California coast and drove storms from the gulf of Alaska away. Sadly I cannot find the image when a red line was off the central, and southern California coast with nothing near as warm close by. Gee Mr. Wizard, couldn't it be a geothermal event? Does anyone remember Mr. Wizard? The O.C. Center of the Universe. Notice the red line off the California coast. Detached from the equatorial warming! Thanks for the best image of the West Coast's thermal blob. When I was a kid, the ocean was usually just below 70F at its' warmest. Today, the same beaches were 10 degrees warmer last month.